The Mauritshuis Royal Picture Gallery in The Hague, Netherlands. 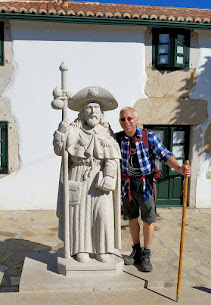 All content is property of EuroTravelogue™ unless otherwise credited. Unauthorized use is prohibited. Welcome to August's ArtOdysseys my friends! Topic for the month is "Museums" and while I've been to many of the renowned and cavernous European gallerys including the Uffizi Gallery in Florence, the Louvre in Paris and the Vatican Museum in Rome, this month's article will feature a more intimate connection at the Mauritshuis Royal Picture Gallery located in The Hague, The Netherlands—a 17th-century palace on the Hofvijver that celebrates the Golden Age of Dutch and Flemish painting. Much smaller than her sisters mentioned above, the Mauritshuis can been seen in half of a day. What I especially loved about my visit was that I oftentimes had the paintings all to myself! It doesn't get better than that when it comes to immersing in art! Renowned for its superb collection including Paulus Potter's "The Young Bull," Vermeer’s "View of Delft," and Rembrandt’s "The Anatomy Lesson of Dr. Nicolaes Tulp," the Mauritshuis is also home to one of my all-time favorites—a surprisingly small portrait of a young girl wearing a pearl earring—Vermeer's "The Girl with a Pearl Earring." But you'll see all of the masterpieces from the Dutch and Flemish Golden Age including Van Dyck, Rubens, Avercamp, Brueghel and countless others. While I would love to write about each one of these masters, my focus is on three of my favorites. Of course, like many museums, photography is forbidden so the pictures of these paintings are borrowed with proper attribution. With audio guide in hand, and I strongly recommend it, I set out to explore a few pieces of the Mauritshuis collection. Hendrick Avercamp's "IJsvermaak / Winter Ice"
Hendrick Avercamp's "Winter Ice." This photo only: Wikimedia.org. Painted with oil on wooden panel in 1610, Avercamp's "Winter Scene" is an extraordinary painting that captures everyday life made splendid in the frozen Dutch countryside during the 17th century. Painting in the style of another Dutch master Brueghel, Avercamp (1585-1634) was the first Dutch artist to specialize in painting winter landscapes of the Netherlands. Combining quintessentially Dutch icons—windmills and drawbridges and life on the canals—he portrayed his cast of many characters and classes, at work and play. What I particularly enjoyed most about this painting is that as the spectator, I am transported back in time to 17th-century Holland and immersed into the daily lives of the residents who live there. For a better look at this painting, view it here and be sure to zoom in for a closer inspection. Close-up view of the left side of Hendrick Avercamp's "Winter Ice." This photo only: Wikimedia.org. From the hardships of life on the frozen canals to the joy of a leisurely skate, Avercamp portrays his subjects so realistically that every inch of the painting beckons for closer inspection. Look carefully at the left and you will see women who have fallen through the ice while a man on shore rushes to rescue them with a ladder. Another woman, just to the upper right is washing her laundry in the freezing waters while the working class struggle with their bundles of sticks. Center stage features men and boys engaged in "colf," a game similar to today's games of hockey and golf; and in the background near the drawbridge, a woman has slipped on the ice and exposed her underside—a touch of Avercamp's humor. Clad in their finest attire, the upper classes enjoy a leisurely skate including one whimsical character donned in his finest gold shirt and stockings stares directly at you and me from his frozen Dutch home. 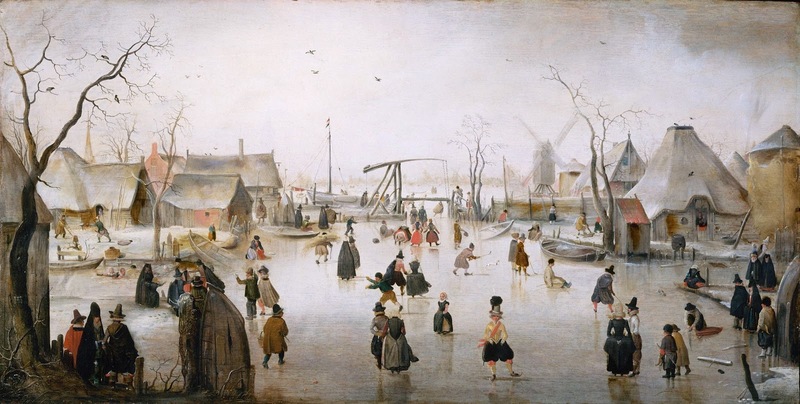 The entire painting is a panoramic view back in time at everyday life in the frozen Netherlands. Johanne Vermeer's "View of Delft"
Vermeer's "View of Delft." This photo only: Wikimedia.org. Renowned as one of the most realistic paintings of the city of Delft at the time, Johanne Vermeer (1632-1675) painted his "View of Delft" from a southeastern perspective. 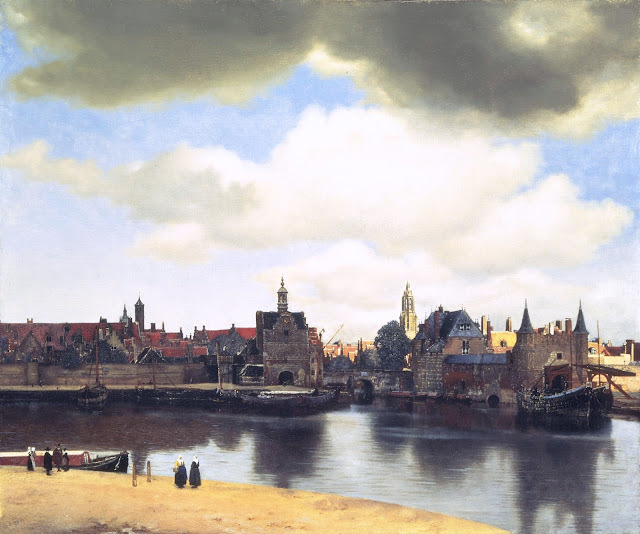 Painted with oil on canvas in 1660-1661, Vermeer divides his composition of this idyllic scene into thirds drawing our attention to the calming surface of the Schie Canal with its dramatic reflections of Delft; up to and deep into the city itself with its colorful skyline of red and blue rooftops; and finally to the ominous clouds above. While all appears calm in the city on this day, the foreboding clouds cast stark shadows plunging the foreground city facades into shadow while the sun shines brightly in the distance, drawing our eye farther into the depths of the painting, a tribute to Vermeer's mastery of realism. I was drawn to this painting for many reasons: the extraordinary depth Vermeer achieves that I mentioned above; the fanciful Dutch architecture from the stepped gables and sunlit Nieuwe Kerk (New Church) belfry to the crenellated walls and stout spires of the Rotterdam Gate; and finally the textured effect of the stone facades which Vermeer created by mixing grains of sand in his paints—rendering them remarkably lifelike. But what exactly are we seeing in the view of 17th-century Delft? According to 17th-century maps, we are standing near the Kolk harbor looking north into Delft. From the left we see the Brewerey De Papagaai, Kethel Gate, Schiedam Gate, New Church tower and the Rotterdam Gate on the right. 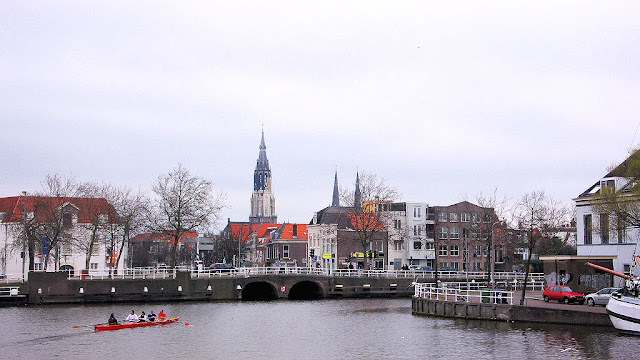 Below is photograph showing the same perspective of modern-day Delft. A view of modern-day Delft with the spire of the Nieuwe Kerk rising in the background. This photo only via Flickr Creative Commons: Komehachi888. 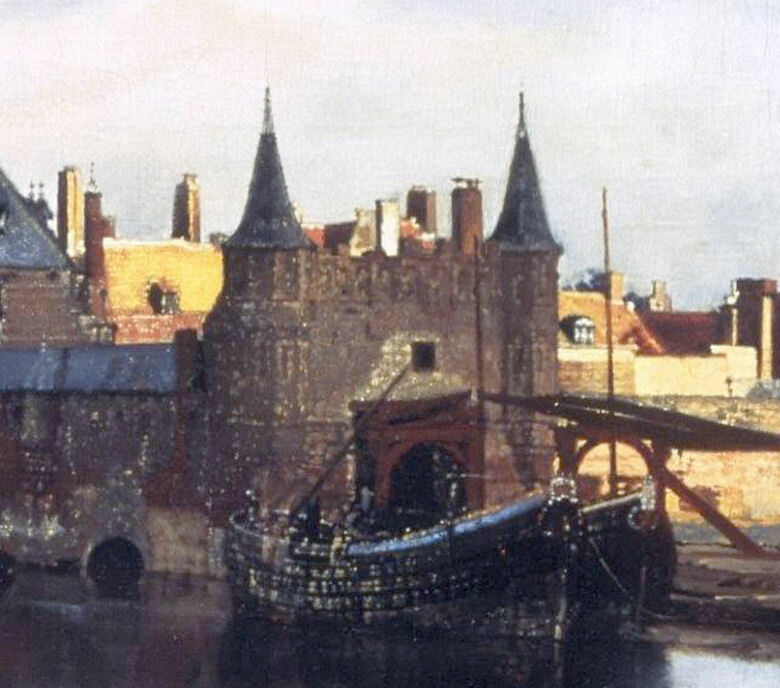 Close-up view of the Rotterdam Gate from Vermeer's "View of Delft." This photo only: Wikimedia.org. 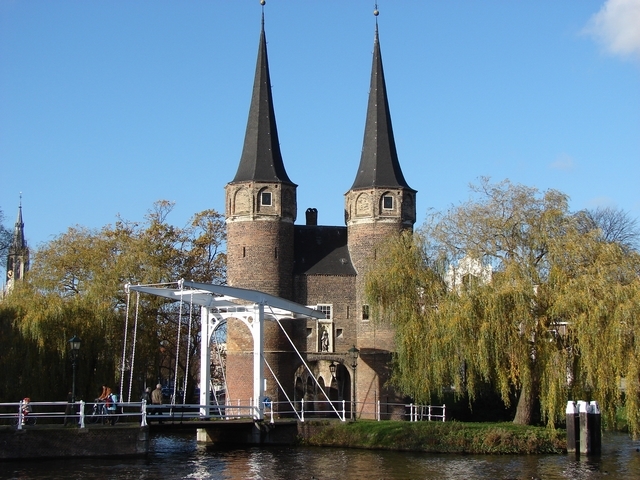 Modern-day view of the Rotterdam Gate in Delft, The Netherlands. This photo only: Wikimedia.org. Vermeer's "The Girl with a Pearl Earring"
Vermeer's "The Girl with the Pearl Earring" as seen at the Mauritshuis Royal Picture Gallery in The Hague, The Netherlands. This photo only: WikiMedia.org. Just who is the girl with a pearl earring? She captured our hearts when the book and movie of same name were released but why do we love this girl we know very little about? Sometimes referred to as the Dutch Monna Lisa, "The Girl with a Pearl Earring" was painted with oil on canvas circa 1665-1667. Vermeer shows us this endearing and expressive young girl wearing an eye-catching pearl earring—which becomes the focal point of the piece. 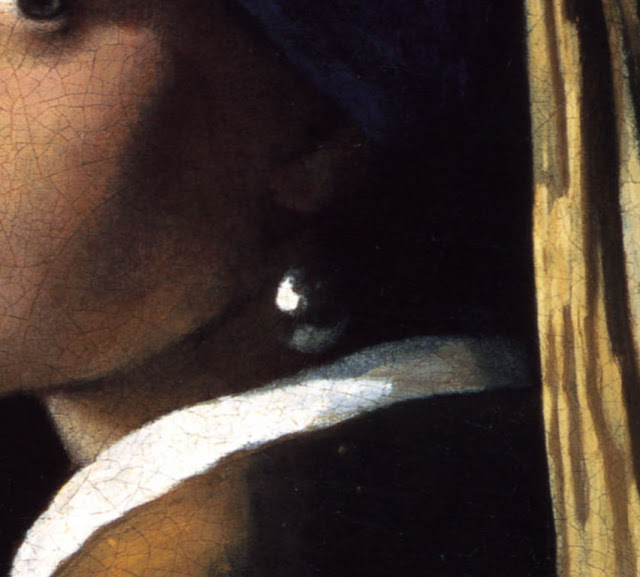 Close-up view of Vermeer's "The Girl with the Pearl Earring." This photo only: WikiMedia.org. With just two brushstrokes, Vermeer achieves a stunning effect with a highlight at the top of the pearl and a soft reflection of her collar below. And our eye is drawn to her expressive eyes looking directly at us as she turns her head in response to our unexpected intrusion into her world. View "The Girl with the Pearl Earring" up close. But is this a portrait of a young Dutch girl in the day? Actually, this style of painting was known as a "tronie" in which a model was used to convey a particular emotional expression or effect desired by the artist. We know this to be true because Dutch girls would never have been seen wearing such a turban or even her yellow garment. Vermeer completed two in his day but it was Rembrandt who made famous the tronie in his myriad portraits. A couple of other paintings from the Mauritshuis Royal Picture Gallery that deserve honorable mentions are an extraordinary portrait of "Homer" by Rembrandt and Brueghel's "Adam in Eve in Paradise" that portrays the biblical couple in lush landscapes and surrounded by exquisitely rendered wildlife. I hope you enjoyed this tour through some of the finest masterpieces of the Dutch and Flemish Golden Age of painting. I hope you discovered something new and that it inspires you to seek out the arts in your travels. 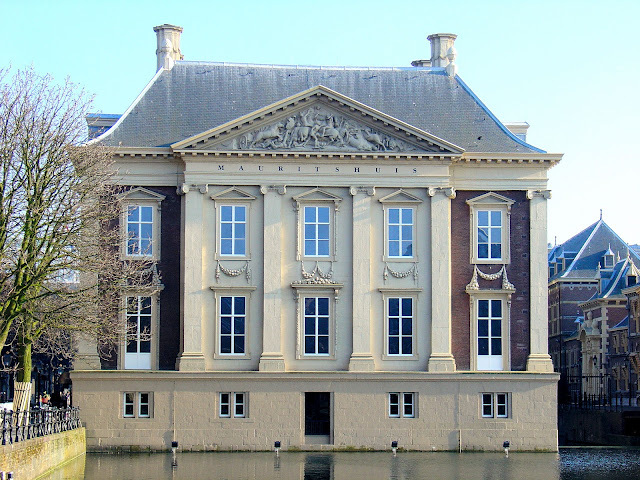 Mauritshuis Royal Picture Gallery located in The Hague, The Netherlands—a 17th-century palace on the Hofvijver that celebrates the Golden Age of Dutch and Flemish painting. Due to the Mauritshuis' renovations and expansion plans from April 24, 2012 to the middle of 2014, approximately 70 paintings will be moved from the Mauritshuis Gallery to a separate wing of the Gemeentemuseum, also in The Hague. These include: Vermeer’s "View of Delft," Potter’s "The Anatomy Lesson of Dr. Nocolaes Tulp," as well as the gift shop. You can still visit the Mauritshuis for the remainding collection. 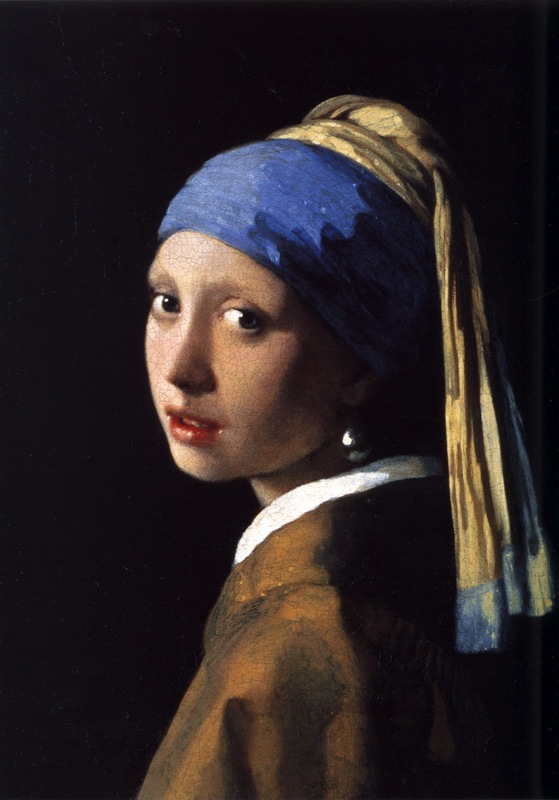 As for "The Girl with the Pearl Earring," she departed for a tour of Japan and the United States through the end of 2013. Discover more of the Mauritshuis Royal Picture Gallery. I did not know about this museum before reading your post. Thank you for introducing me to it! Like you, I love the winter scene and similar paintings that show life of the ordinary people from that time. Hi there Jenna, I am so happy to have introduced you to the Mauritshuis! I too, have never heard of it until my visit onboard Viking! I loved the entire museum and only wished I had a few more hours there...but very manageable for afternoon visit. Thx so much for stopping by to share your thoughts! Aaaaa!!! I love Rembrandt's Anatomy Lesson! I even wrote a paper about it. This museum sounds like my ideal kind, small and quiet but full of recognizable pieces. Nothing beats having a gallery to yourself. Erin, I couldn't agree with you more. I had these paintings to myself...it was extraordinary! The next time you visit the Netherlands, seek it out but wait until the museum reopens after renovations when all all the pieces return to their rightful home! Thx so much for stopping by to share you experiences! I was quite excited to read your post because San Francisco is one of the cities that the lovely "Girl with a Pearl Earring" will be visiting on her tour of the US! I'm hoping they send along some of the small genre and landscape paintings as well - that one by Avercamp is one of my favorites from this period. So much detail and narrative packed into one scene! Hi there Ashley and thanks so much for stopping by! When I read about the US tour I saw that the de Young on the list. I know that's not your musuem but is it close by I hope? Thx for sharing your thoughts about Avercamp...I just love that painting for all the same reasons! I really like your posts, Jeff. I loved this one - I always learn something and get in the mood to get to places. I recently read a book - Europe by Fast Trains by Tom Chesshyre, that I think you would love. It would go very well with your European art series. Thank you for this. May need to go to the Netherlands again. Oh and I love smaller museums - closer to you! Hi Ana and thank you so kindly for your compliments! They go a long way with me! Oooh...a book about European trains??!! Wow, need to look that up right now and add to my Amazon wish list! You are so kind my friend to stop by to share such wonderful sentiments. Thank you! Hi there Leslie and couldn't agree with you more on the Vermeer obsession! I have loved "Girl with Pearl Earring" forever and when I saw "View of Delft" in the Mauritshuis, I couldn't take my eyes off of it! Thank you for stopping by and for your kind words! Wonderful post, Jeff; Dutch painting is dear to my heart. So refreshing to view lovely landscapes, interiors and portraits after the steady diet of religious work that constitutes so much of old European art. As a former gallery tour guide, I love that Dutch painting can be appreciated by everyone, no matter their age or whether they have a detailed knowledge of the Old Testament or not. Holland in general is a great way to ease into Europe. Hi there Leslie and thank you so much for stopping by and sharing your thoughts about Dutch painting. I share your admiration for it as well and Brueghel is one of my all-time fav artists. And, I completely agree with your point of view regarding Dutch art...it truly can be enjoyed by everyone! Thx again! What a lovely gallery! My 9 year old daughter has a list of paintings that she wants to see and The Girl with the Pearl Earring is one of them. I didn't know that the painting was going on tour so I'll have to check if it's anywhere that we can get to easily. Hi there Lisa and thanks so much for stopping by. When "The Girl with the Pearl Earring" arrives in the US, its first stop is the de Young Museum in San Francisco. Then, it's on to the High Museum of Art in Atlanta and finally to NYC at New York’s Frick Collection. 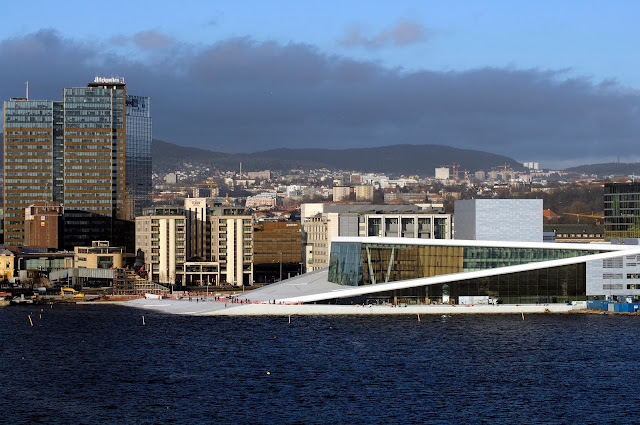 Hopefully one of these venues will easily accessible to you and your daughter. Thx again for sharing your thoughts with my readers! I will add this to my "must sees" when I get to the Netherlands! You shared a great selection of paintings. I'm in awe of artists. Hi Debbie and thank you for sharing your thoughts! 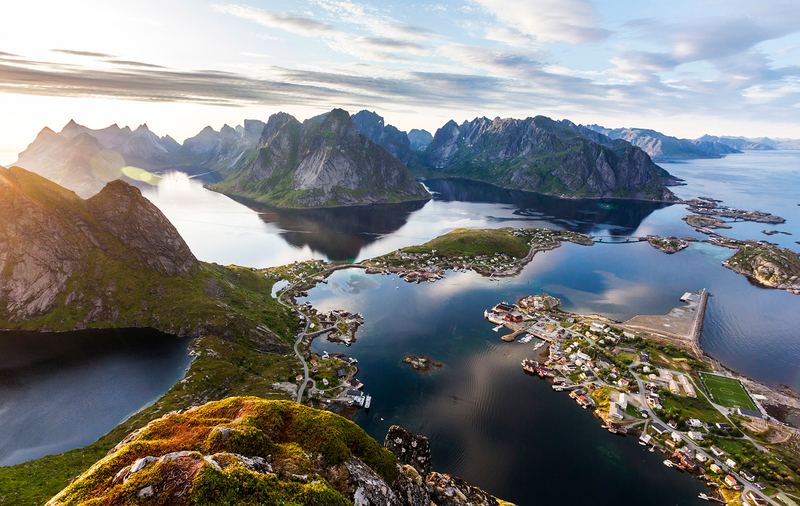 Yes, you must add to your bucket list the next time you're in the area. 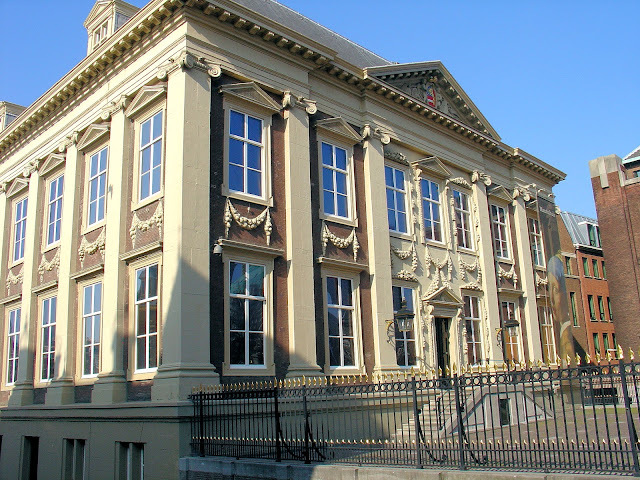 However, keep in mind that while the Mauritshuis undergoes renovations, part of the collection has been moved to Gemeentemuseum, also in The Hague. Thx for your kind words too my friend! Lovely round-up of paintings. Vermeer is a favorite of mine, and I think I have seen the "Girl with the Pearl Earring" somewhere in my travels. Thank you so much my friend for stopping by and for your kind words. There were so many paintings that really lured me in but had to pick my top three of what I saw in my brief visit. Wish I had a few more hours to really see them all. Vermeer is def one of my faves too! I saw the 'Girl with the Pearl Earring'when I visited Den Haag in 2006 ... and, even if photography were permitted, it would be a waste of time, as no photograph can do it justice; you MUST see the painting itself. Other galleries I'd recommend are 'Escher in het Paleis' (not sure whether this was a temporary one or not) and the Mesdag Panorama. Hi there! Totally agree with you and I was lucky enough to see it at the Mauritshuis when I visited last year - just before it left on tour to Japan and US. Thank you for the recommendations too!